The Search or the Shuffle/Repeat function of a certain number of NW-E503/NW-E505/NW-E507 Network WALKMAN devices may not work correctly under certain conditions. If firmware version is 2.0, YOU DO NOT NEED TO UPDATE THE FIRMWARE OF YOUR NW-E503/NW-E505/NW-E507 Network WALKMAN. Select NO and EXIT. NW-E50X_V2_0C.exe - 2239 Kb, (depending on the model you have). 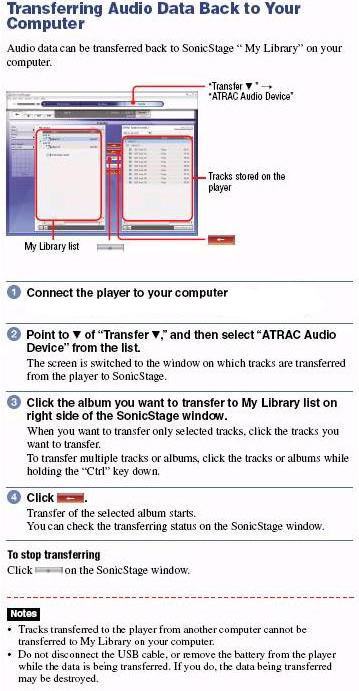 Before going further you need to back up all the data contained in your NW-E503/NW-E505/NW-E507 Network WALKMAN to your computer and free up at least 3MB memory on your Network WALKMAN. On your computer, go to the C:\ WMFWUPG folder and double-click NW-E50X_V2_0C.exe, depending on the model you have.